Step 1: Develop proper mobility – especially through your thoracic spine! It’s extremely important to assess your clients/athletes prior to having them train with you. SAPT’s Evaluation Specialist, Jarrett Brummett, developed our movement screen using the FMS and SFMA. The evaluation allows us to assess our client’s level of preparedness before starting them on a strength and conditioning program. It ensures that we start them with the appropriate level of intensity and it provides us with information to indicate or contraindicate certain exercises. A lot of the time, people walk in our doors with fairly immobile thoracic spines, compensating by rotating through their lumbar segments. One of the first things that we’ll work on in these instances are increasing their ability to move through their thoracic spine and hips, as well as improving their scapular glide and control. Below are a few of our “go-to” thoracic spine and shoulder mobilizations. Step 2: Develop sufficient core stability. I don’t think I need to harp on the multitude of reasons why core stability is important, but what you may not know is that your core is built to resist, not necessarily create, movement. Imagine a running back hitting the hole, 200+ lb defenders clawing at his shoulder and hip pads trying to bring him down. He’ll need to be very strong through his midsection to resist these forces, break the tackles and keep plowing forward. Concentric Brain provides a long list of anti-movement core exercises, and I’ll list a few below. As you can see Concentric Brain’s 11,000 exercise library is categorized in such a way that you can easily pick exercises based on the movements (or anti-movements in this case) they consist of. 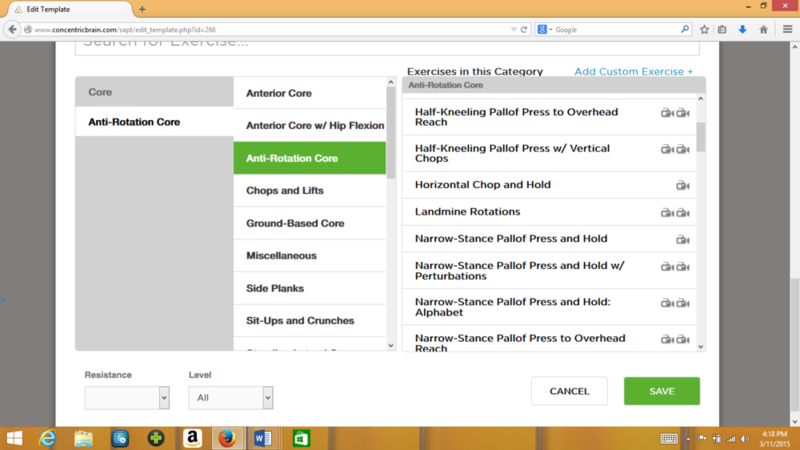 The software also makes including these anti-movements in a “Core Stability for Rotational Power” template incredibly easy! After ensuring the athlete has adequate thoracic mobility and core stability, we will begin introducing rotational movements to the athlete’s program. These include medicine ball throw variations and single-arm rowing variations that include some thoracic spine rotation. Medicine ball “power” oriented movements are great to incorporate in the beginning of a session when the athlete is first learning them. As they become more proficient, gain strength, and begin to enter intermediate status, these exercises can be used in conditioning circuits or as “finishers” to teach the fast-twitch fibers how to produce force repeatedly, even in a semi-fatigued state. 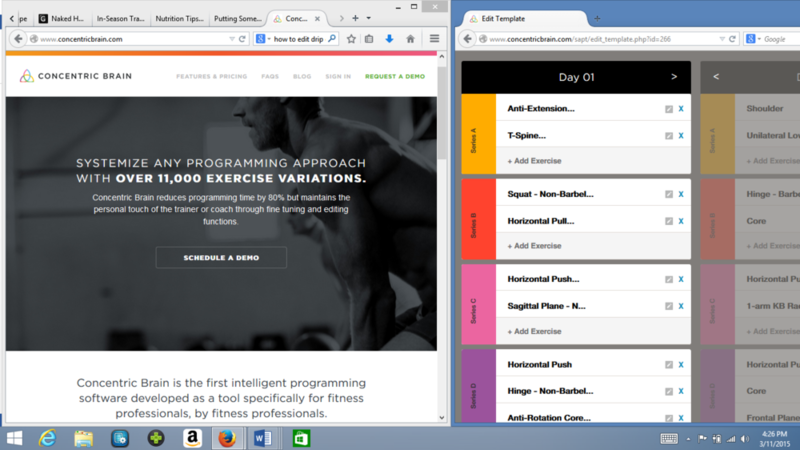 You can set up templates in Concentric Brain for both of these situations; making an “Intro to Rotational Movements” and an “Advanced Rotational Athlete” template that will allow you to plan ahead and include the movements at various times in the workout to target different physiological adaptations. If you’ve reached this point, you’re on the right track. Your athlete has great core stability, enabling them to generate and transmit force through their torso, and has developed an awareness for rotating through their thoracic spine and hips while keeping their lumbar spine neutral. The neural changes that take place in the early stages of skill development have occurred, and it’s now time to work on some serious rotational force and power development. Although the volume will ultimately be left up to you, Concentric Brain does provide suggestions. The software also has quite a few advanced variations that should not only satisfy your athletes craving for variety, but also develop rotational speed and power in a variety of different ways. Below are a few video examples of the variations we like to use at SAPT.